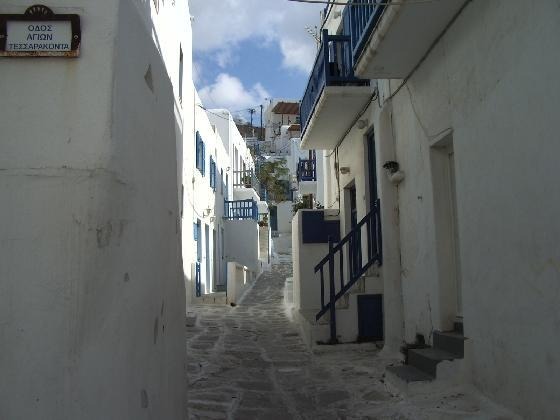 Mykonos is famous for parties, gay bars, tourist ships unloading parades of people and visions of beaches packed with sunbathers during the high season. I was lucky enough to discover this beautiful island during its down time when the island is about to go into hibernation. We were met at the port by a woman who offered accommodation in a nice room at her typical local style house ( whitewashed with blue window frames) overlooking a quiet courtyard in the old part of the island near the sea, conveniently walking distance from all the attractions, for a very cheap rate! We had our own small kitchenette, private bathroom with 24 hour hot water, and a small veranda which I liked sitting out on, enjoying the nice weather, fresh air and reading a book. We were there, in my opinion, at the right time- experiencing what the island might have been like BEFORE mass tourism, materialism, mass promotion discovered Mykonos and made the island what it is during high season. Strolling freely down back alleys, no rush, no crowds, no pushy atmosphere, getting served straightaway in restaurants, going to quiet beaches, smelling fresh sea air instead of suntan lotion. People served with a smile and looked at you and not just your wallet. Now that I had tried this experience in Mykonos, I will visit other islands around the world famous for its busy life which, when I visited then, was "turned off" by the atmosphere, and will re experience them once more under a different feeling.